Summary: Boundless Grace is the sequel to Amazing Grace. Grace is an older elementary aged girl who loves stories. When Grace begins to question the make-up of her own family—her parents are divorced, and she lives with her mother and grandmother—she goes on a trip to Africa to see her father and to meet her step-mother and half-siblings. As Grace begins to explore her roots and accept her extended family as her own, she realizes that families come in all different shapes and sizes, and the make-up of her family is an important part of her own story. Literary elements at work in the story: Boundless Grace is a narrative, told in the third person. It is filled with rich dialogue between Grace and her father and Grace and her grandmother. The story is framed by Grace’s ties to America, where she lives with her mother and grandmother. However, most of the story is set in Africa, where Grace’s father and his new family live. The book chronicles Grace’s trip to Africa, where she travels with her grandmother to see her father and meet his new family, and where she tries to make sense of her own story. The book ends with Grace and her grandmother waiting at the airport to catch their plane back to the United States. At the airport, Grace and her grandmother talk about Grace’s story and about Grace’s family—a family that spans two continents, but is very much her own. The illustrations throughout the book are rich and colorful, and they capture the beauty of African culture, as well as the wide range of emotions that Grace experiences on her journey. How does the perspective on gender/race/culture/economics/ability make a difference to the story? 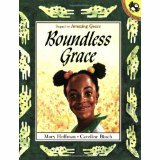 Grace is a spunky, imaginative, introspective young African American girl. Grace lives in a happy, loving home with her mother and grandmother. When Grace and her grandmother travel to Africa, the reader will be immersed in African culture which is vividly portrayed through the language and illustrations on the pages of the book. A key focus of this story is family, and how all families are different. The author and illustrator of Boundless Grace do an excellent job of portraying this family’s unique qualities without sugar-coating the wide range of emotions experienced by Grace. In the beginning of this story, how does Grace feel about her father? Does Grace change her mind about her father once she travels to Africa and gets to know him? What are some of the things Grace learns about her father in Africa? Who are the members of Grace’s family? How are families alike? How are families different? Families are a gift from God, no matter what your family looks like. Will you pray with me as we thank God for the gift of our families? Boundless Grace by Storypath is licensed under a Creative Commons Attribution-NonCommercial 4.0 International License.